Using Business Intelligence, Analytical Solutions are created to improve the operations of MFIs and Banks to make them sustainable in the long run. 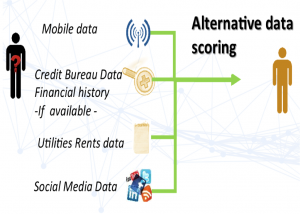 Analytical solutions enables MFIs to identify areas that are performing and providing return so it can be focused on. In addition, it recognizes the problem areas that are leading to delinquencies and loan losses so those areas could be improved. Analytical solutions enable MFIs to achieve better results by monitoring their performance and facilitating portfolio management with day-to-day view of the performance. More informal institutions that cater to the poor, a growing population, shy away from technology despite tech being the solution to control costs and improve operational efficiency. In our case studies, we have noticed that using software solutions and technology that are tailored for a particular business gives better results and saves overall costs. Why MFIs need to focus on improving their operations? FinTech is at the forefront of the transformation in the financial industry and is transforming the way we exchange value and ownership, manage risks and perform transactions. Financial Analytic’s Platform (FAPsm) uses banking model that analyzes raw data and generates insights based on predefined Key Performing Indicators (KPI). The model consists of the following modules that are used so that MFIs are able to focus on their important operations. 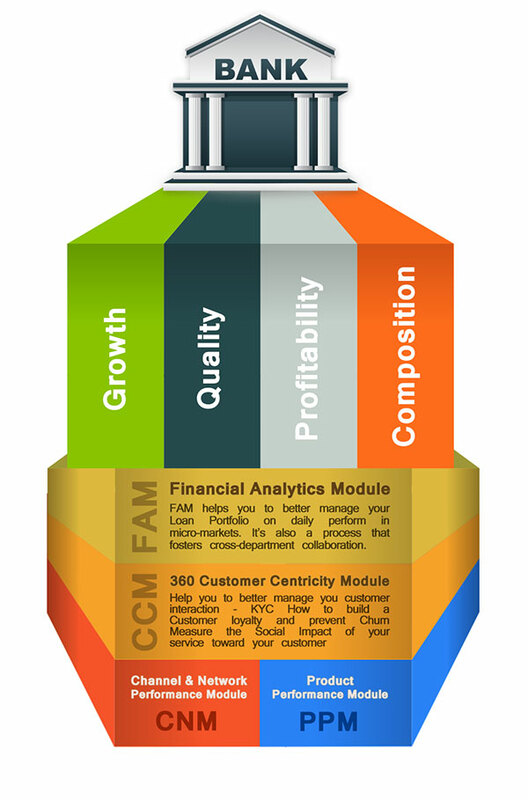 The Finance Analytics Module (FAM sm ) mainly helps you monitor your loan portfolio and operational efficiency. It enables you to identify the root causes of business problems – for example loan officer overload as a primary cause of portfolio delinquency. These are followed up by actionable solutions that may be assigned to an accountable stakeholder for follow-up all within the software. The Channel & Network Performance Module (CNM sm ) provides the day-to-day view on the performance of the MFI and its operations. It provides a complete view of the network and its channels and identifies the network whose elements are utilized most efficiently. It also monitors financial inclusion among the market base, identifies potential for expansion and more. The 360 Customer Centricity Module provides tools that enable you to monitor the most important aspects of customer management: KYC (Know Your Customer) , acquisition, churn, transformation, et cetera. For example you will be able to track the impact that your loans have had on your customers’ access to education. You will also be able to understand their most common complaints, get actionable suggestions to help you address them, and be able to assign chosen actions to the relevant parties, all from within the tool. The Product Performance Module (PPM sm ) enables you to assess the success of your product offerings and tailor them to your customer, network and financial goals. Cloud-based solutions are also available for those MFIs that do want to use it instead of web based solutions to help in reducing the infrastructure costs and work with the existing cloud based applications. It enables saving costs of data transfer and optimizing the overall performance.